Here's a look at the Class Power Rankings after Day 1. 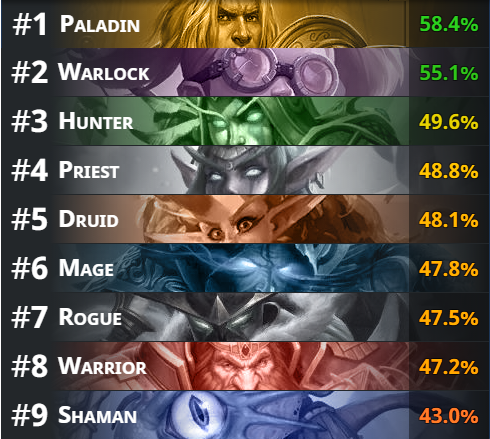 Paladin and Warlock continue to occupy the tops spots with Hunter also having an impressive showing so far. 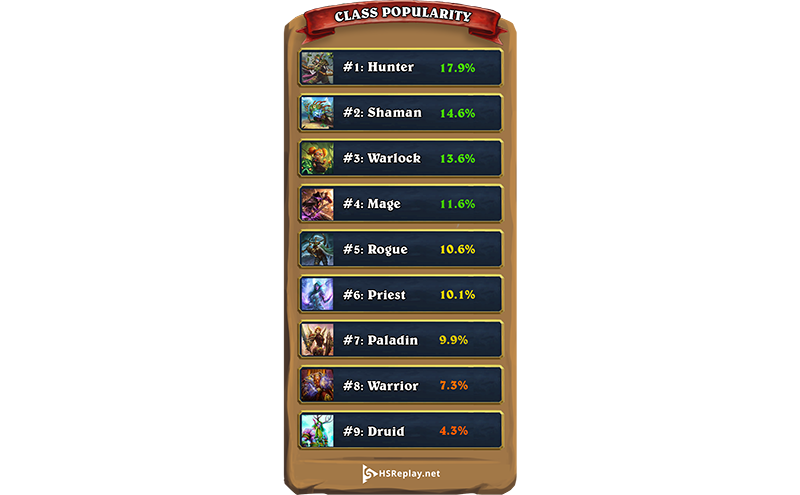 As controversial as Shudderwock has been, we see Shaman sitting in the bottom spot by a good margin. There's a lot of flash and entertainment when it comes to the Battlecry Shaman but in the end, the aggressive decks are beating it consistently. 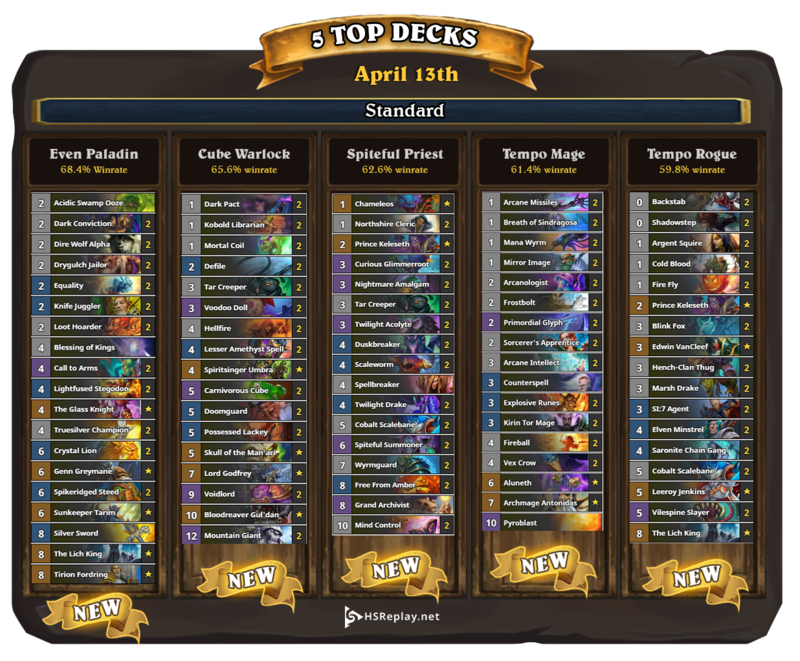 We see quite a contrast right now between the best decks and what is popular right now. Here's the class rankings based on popularity right now. With the Shaman being #2 on this list, it's clear that Shudderwock was very high on players' lists to try out first. Paladin on the other hand wasn't played nearly as much even with the high win rate. After months of Paladin dominating the meta, players wanted to try something else... at least on the first day. Even Paladin: This deck is dominating the meta with a mixture of power cards from the most recent Silver Hand Paladin with old favorites from Midrange Paladin. It turns out it's pretty easy to build around Genn Greymane. Cube Warlock: This hasn't changed much but Voodoo Doll and Lord Godfrey has made the deck even more effective from a removal standpoint. Spiteful Priest: Priest lost a lot of dragons but has done well filling in the holes with the new cards to bridge to the power turns on turns 6 and above. Tempo Mage: The deck hasn't changed too and still effectively pressures. The addition of some value with Vex Crow and Archmage Antonidas give it some more firepower late in games. Tempo Rogue: It's back! Hench-Clan Thug and Marsh Drake have been incredible for the Rogue class because of the hero power. Day 1 of The Witchwood has been a fun ride! Try some of these decks out and let us know on Twitter how you do with them!